Noted Mising personality, who was involved with various community organisations in critical juncture of the tribe- Sibaram Pegu- is no more. Pegu left for heavenly abode after a week-long illness at his Laimekuri residence yesterday in Jonai. Pegu was a dedicated community mobilizer who lead the people during nascent stage of Mising ethnic nationalism from seventies to early nineties. He was a founder member of Takam Mising Porin Kébnag ( TMPK), that was re-christened on October 16, 1972 at Jonai Higher Secondary School, after the bifurcation of All Abor-Miri Assam-NEFA Students' Union ( another group is the powerful All Arunachal Pradesh Students' Union), when the state of Arunachal Pradesh was declared first as union territory. During the period of anti-foreigners movement of Assam from 1979 to 1985, he had to left his post-graduation studies incomplete from Gauhati University. He went to establish, later on, the Laimekuri Koneng High School, realizing the importance of women education and empowerment in the society. 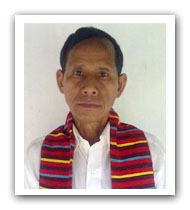 Pegu was an active member of Mising literary movement in the eighties. He served as the general secretary of Mising Agom Kebang from 1983 to 1987 consecutively. 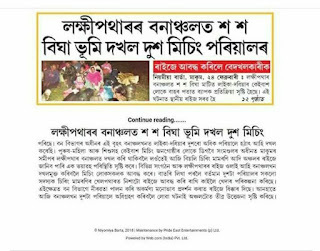 It was during his tenure the Mising language was recognized formally with adoption of Roman script in October 30, 1986, when the regional party AGP was in power in Assam, which is today observed as language day by the community. The Mising organizations have expressed deep condolence over his untimely demise and said it was irreparable loss to the society. His mortal body was taken around several places in Jonai where hundreds of people paid their last respects to the deceased Mising national personality. His body was cremated with full honours according to Mising social rituals and rites. He was born in Haldhibari village of Sisikalghar and was 58. He left behind his wife, a son and three daughters as well as number of friends, relatives and well-wishers. Last month in early July, when I met him in Laimekuri, whom I fondly called Tato, he was looking quite well. When I enquired about his well-being , he replied in positive and exhorted me for further good studies. " No okkoméi idakji aiyo:pé ilang", he advised me. Once in summer 2009, he came over to our house to congratulate me on hearing the news that I passed my graduation with flying colours from Cotton College, my parents told me, later, since I was already back to Guwahati . When I was doing my post-graduate studies, and was in home due to a brief vacation, he once stopped me and passed me hundred bucks seeing me to have light refreshment in the journey to Guwahati. He didn't gave me just the bucks but shared inspiring thoughts with me, which I will remember it in my entire life, for it is done rarely in our place. He had that personality , at least , to inspire the lower strata within the community, not just a leader. I am really very sad to learned that a towering personality like him is no more in the society. I was thinking of having an interview relating to the present and past state of society with him one day but he didn't lived upto that. With tears...I am expressing my grief. RIP my dear Tato!